Beautiful backgroundpapers with this technique. Thanks for the inspiration! Wow - so very cool! I want some inks to play with! Wow, love the creativity in all the different types of papers you used with the inks. Nice tutorial. Great project Sandee! 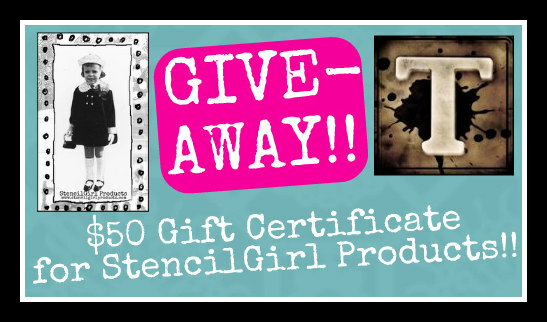 I love the background you got here, and that's always been one of my favorite stencils! Sandee I LOVE all the prints you made! I can't wait to play with my inks and gelliplate! Thank you for sharing! Thank you for a great tutorial.....I've never tried using alcohol inks on my gelli plate......can't wait to give it a try. OOh I LOVE your art journal pages! These are amazing! While I have never used a gelli plate I love the results. Such amazing backgrounds!! Love them. Will have to try this technique! putting this idea to work. Thanks for sharing your fabulous technique. Beautiful papers. Hi Sandee,these backgrounds are great! I love all of them but especially your project with stamped words. Thank you for sharing. I love this! It looks like so much fun! i appreciate you showing the results on all different kinds of paper. Such great art pieces! I'm always astounded at the way different artists like yourself layer things up and arrange in such a way as to get great projects. I just end up with a mess when I try. Love the colors, stencils and art work. This is a great HOP! Great results! What happens to the sanitizer? Does it evaporate? 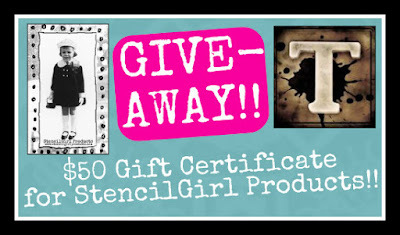 I’ve GOT to find those stamps...I think I have the stencil! love the two different pages! cool patterns! Yay! Another use for my (um, one of my, lol) gel plates! Thanks for sharing! This video provided a wealth of ideas! Loved the hand sanitizer idea. Thank you for the inspiration - the first day of the blog hop has given me some really great ideas for using a medium I've not explored before. Your tips and technique explanations were very helpful. love it, looks like so much fun! 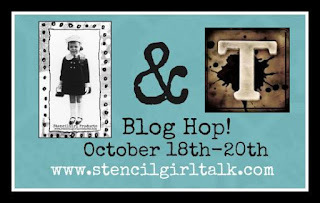 I love this stencil and how you've used it! Beautiful journal pages! Love the designs and colors! These would be fabulous backgrounds for some of my paintings! Thank you for sharing. Sandee, such an awesome post. I can't believe how many prints you got out of that one inking. It make me think of those old Ronco commercials, "But wait, there's more...". Your pages made me smile. I'll be buying some hand sanitizer soon! Sandee, I am very impressed by how many prints you got from the first print. Using the gel in this way was the first time I have seen this technique. I can see why it works with the alcohol inks. Great idea! I love all the prints you made and how you used a fine marker to draw the design, then your creative use of adding other elements was inspiring. Thank You! I have got to get some alcohol inks! That tutorial using hand sanitizer was AMAZING! Sandee, just WOW! Love how you get so many background options from this technique. And as always, love your creativity. You continue to inspire me. Thanks! Love the colorful prints you got from the alcohol inks...got to try this technique! I am mesmerized by the difference in the prints. You have so many fun play things now! The hand sanitizer was a new idea for me and I guess I'll have to find where I put mine. You have made me quite compelled to get out and get some of those inks. Wonderful video! Beautiful prints and final artwork Sandee!! Really enjoyed seeing another great use of alcohol inks and stencils. These are so pretty! I love the different print effects on all the different papers! Beautiful prints! Love how they turned out! These are two wonderful creations ! i love how different the two projects look! Thank you for sharing! I loved your video from the beginning too the end. The stencil, colorcombo of the inks and especially the gelliplatetechnique are awesome. Thanks for sharing! 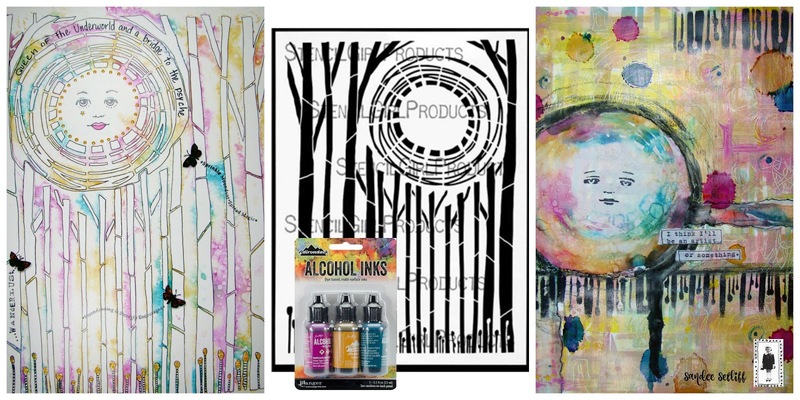 What a great idea using alcohol ink for mono printing project. Thanks for sharing the tutorial and inspirations. I love this post! Thank you for sharing how to do this and can’t wait to create my own!! !